After she's snubbed by her snooty cousins in the Hamptons, 16-year-old Mia Gordon meets next-door-neighbor Simon. 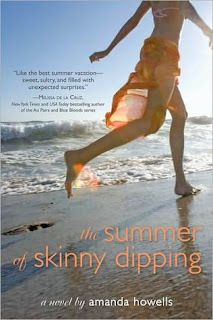 And from the very first time he encourages Mia to go skinny dipping, she's caught in a current impossible to resist. I picked up this book because I wanted a nice summer read and that's exactly what I got. I really enjoyed this book. The majority of it is a lovely YA read about Mia's summer at the beach. She's staying with her family and feels left out because her snooty cousins make her feel uncool and unwelcome because she isn't interested in showing off loads of flesh, or making out with boys she doesn't know or getting hammered every evening. Mia's still determined to make the best of her time as her favourite beach and as a result spends a lot of time exploring the beach alone. That is until she meets Simon. So as I said a nice summer read.... Now that's what I thought. This book leads you down this route where you feel safe in the knowledge of what type of book it is and what it is going to turn out like. it's only in the last 50 pages that the twist shatters that completely and it turns from being light and fluffy to really quite poignant and moving. I didn't see it coming and it really threw me when I got to that point. I don't think I've ever been so thrown off guard by a book before. An awesome book which I really enjoyed with an emotional punch at the end which threw me completely off guard. Highly recommend! I've had this book on my shelves for absolutely ages and really must get around to it soon!